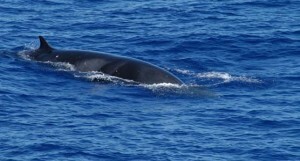 Japanese whalers have killed an estimated 10,000 minke and other whales in the Southern Ocean off Antarctica since a worldwide moratorium on commercial whaling was issued in 1986. Photo courtesy of NOAA. Mangel was part of a team of advisors brought in by the Australian government in support of its case against Japan. He wrote several documents concluding that scientific output from the Japanese special permit whaling program (JARPA II) was limited and that science was not the purpose of whaling activities. According to the UN, “the open-ended time frame of the [JARPA II] programme; its limited scientific output to date; and the lack of cooperation between JARPA II and other domestic and international research programmes in the Antarctic Ocean” cast doubt on the validity of Japan’s claims. Japanese whalers have killed an estimated 10,000 minke and other whales in the Southern Ocean off Antarctica since a worldwide moratorium on commercial whaling was issued in 1986. Critics say Japan was using the guise of scientific research as a loophole to continue commercial whaling. “It was very gratifying that what I wrote had such effect,” says Mangel, who served as an advisor on the case from 2010 to 2013. Mangel has been a Visiting Scientist at PSI since 2012 focusing on the food web dynamics of Puget Sound forage fish. Read the ruling from the UN’s International Court of Justice.